The beginning of Autumn is the perfect time to join the gym except that it gets dark early and its getting colder each week. Gym’s can also be expensive, intimidating and overcrowded. An alternative is to transform your garage into a home gym. Creating a home gym doesn’t need to be an expensive exercise and you can expand on it and the equipment as you build up your enthusiasm for exercise. Best of all its extremely convenient and it gives you an opportunity to finally clean up your garage space and make better use of that expensive realestate. Below I have outlines a few key steps in getting started with creating your home gym. We all know the benefits of exercise but let’s face it, it can be hard work. Finding a range of exercise that you enjoy is the key to getting started. This can be running, biking, weights, aerobics style exercise and even yoga. Its important to define what you enjoy and what you want to have in your home gym. From here you need to begin your basic plan of what equipment you might need (or start with) and how you will likely lay it out and how much space it will take up. The next step is to clear out your garage and clean it up. The key principles with cleaning and reorganising your garage is to categories all of the items lying on the ground. This can include gardening tools, general tools, car related equipment, supplies etc. Once everything that is on the floor is placed into piles you can then begin to work out where to store it all. Remember that you will need to allocate space for the actual gym itself. Its not a matter of just shoving everything out of the way to make the necessary room, this is an opportunity to clean and reorganise your garage. You will be staring at it each time you use the gym, so don’t make the experience any more painful than it needs to be. This all depends on the equipment you will likely utilise. In my case my garage gym is about 1.5m wide and 3m deep. I have a bench and free weights. I also have stool to hold by ez-curl barbel. I also have a small wall that holds my spare weights. If you are going to invest in a running machine, you will probably need a little more room. Its not only the machinery that you need to think about, its also the air around it. Most garages are dirty, dusty, and sometimes mouldy. Therefore its important to clean the space regularly. If you are keen on sit-ups and stretches, its important to have enough room for you mat as well. 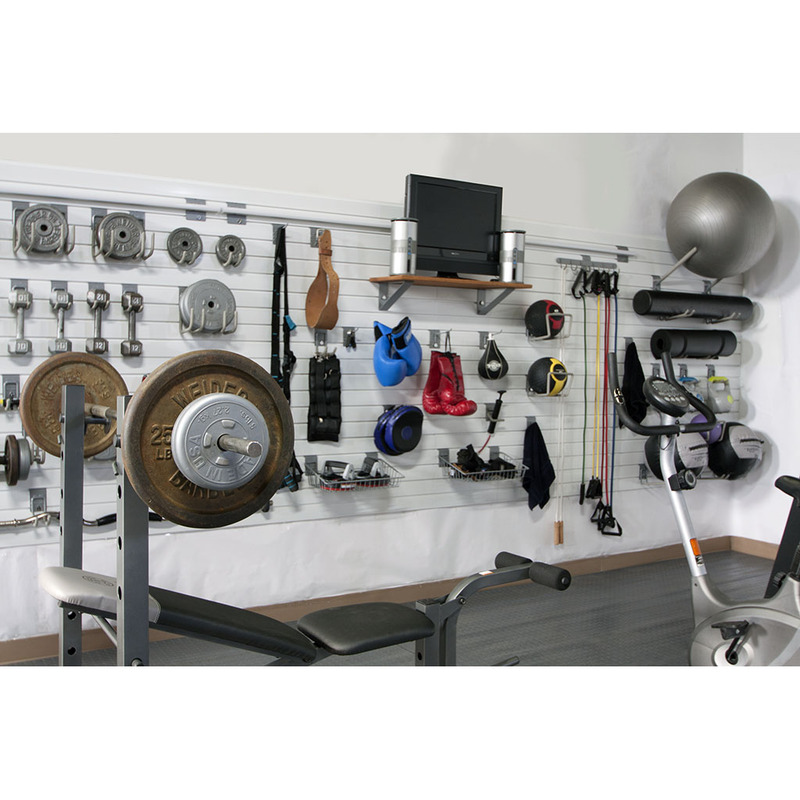 When you transform your garage into a home gym you will end up with more items in your garage. 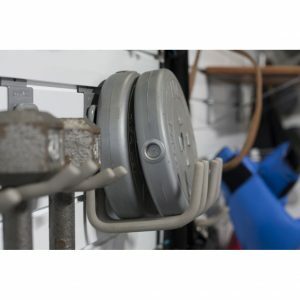 Storing your gym equipment the right way will keep it easy to access as well as clean and protected. The last thing you want is additional hazards with dumbells all over the ground. Storewall’s waterproof and highly durable slatwall panels make it super easy to store your gym equipment. Our broad range of hooks are locked into the slatwall with CamLok ensuring that weights are secure and don’t fall off the wall. Combining our 2.4 slatwall panels with our brackets also means that larger barbels can be stored. You can also add our bins and brackets to store equipment such as medicine balls, skipping ropes and other smaller sporting equipment. In conclusion, home gyms can be a great investment for your health but also your family’s health. Having exercise equipment around the home and having people actually use them means that even the younger generation can get motivated to exercise and try equipment even if it is just for fun. The best advise I can provide in terms of exercise programs is to find the exercise you enjoy the most and begin with those. As you start to build strength and stamina you gradually begin varying the exercises so that you don’t get bored. And finally remember a home gym in your garage does not need to cost you a lot. Its more about the exercise than what the room eventually looks like.